So before temps soar above 100 today I picked & prepped some more dyestuff. 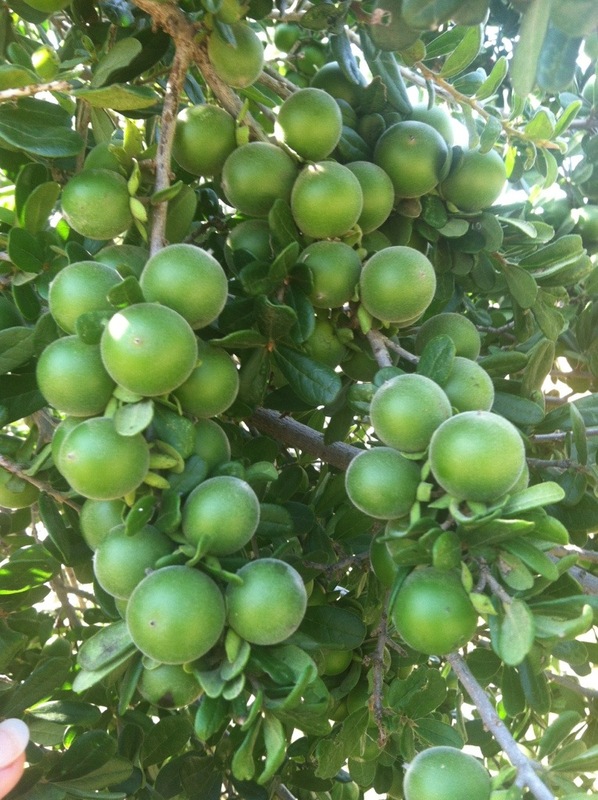 The Diospyros Texana Persimmon branches are heavy with the green fruit and is ready to pick. An item of interest, in the four years I’ve been watching the persimmon bushes I’ve never seen a heavier or thicker crop on the branches. I don’t know if this is the effect of more rain earlier this year compared to the 2009 & 2011 drought years. We’ll see soon how the color comes in on the silk. In addition I strained some of my Parmotrema Austrosinense Lichen which has been soaking in a high ph bath of ammonia and water. The lichens gathered in Dec 12 are on the left and the lichens gathered in early fall 2012 are on the right. My paper towel test gives me a decent indication as to what color to expect a dye bath to yield. Do you think it is the 3 month soak difference or the time of year gathered? Time to wash the dishes & head inside to cool off! One of the most important prep steps in mordanting is scouring the substrate. In this case Crown Colony wool is the substrate. It’s been in the Orvis bath to take out spinning dirt and grease. Next up my husband is helping me with the mordant bath of alum sulfate and cream of tarter. The dyestuff will be my weld that we’ve been harvesting this year. 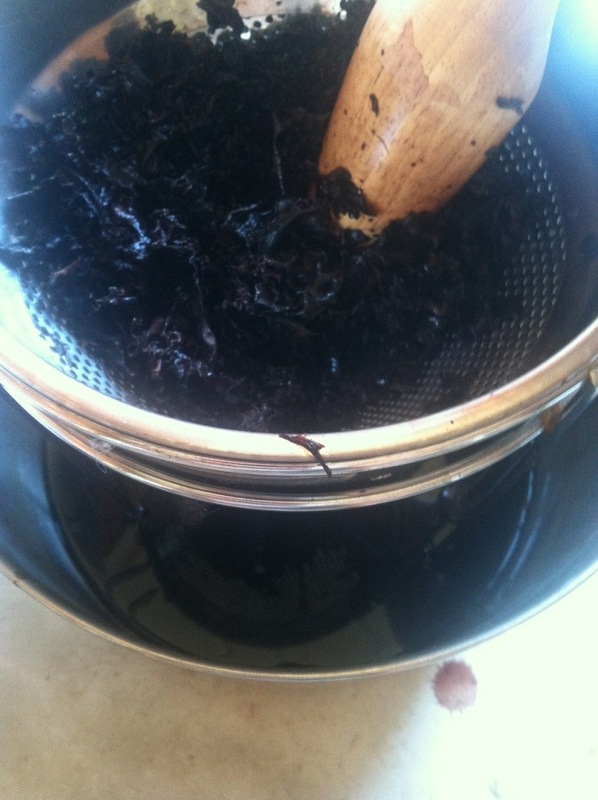 I’ll run a comparison bath to my dried weld leaves from last year. At least that’s the plan for now! I drove down to San Antonio to the Surface Design Association Conference marketplace earlier this month. I met some friends from New York, Delaware and Colorado. We had a great time going thru the art galleries and fiber art supply venders. One of my short term goals was to do some warp painting or other surface design on some warps while I wait for my shoulder to come back into action. My shoulder is on the mend but I have limited range of motion and cannot lift. Throwing a shuttle and lifting dye pots or wet skeins is a no go right now! So I picked up some supplies from Marlene Glickman at http://silkdyes.com/supplies.html She walked me thru making silk blanks into beautiful scarves using a baggie, the dyes and taking advantage of the crease dye method. I saw the potential for some easy warp painting! When all the conference attendees were off in the keynote speech I took advantage of Marlene’s time and she gave me an intro to using the silk paints. 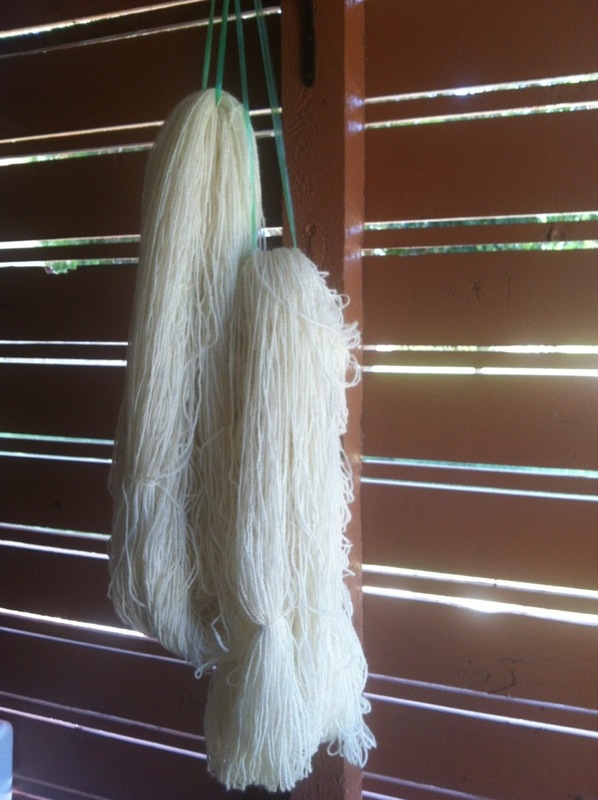 They only work on protein fibers, attach when wet and don’t require heat setting, an interesting acid dye formulation. Since I am a chemical dye rookie this seem like the least investment of time and effort to do some training wheel chemical dyeing. The goal is to prep a couple of warps and see how they look with the stenciling. Before I tackle a warp (which requires winding – more shoulder action) I worked with some stencils and some screen stencils. 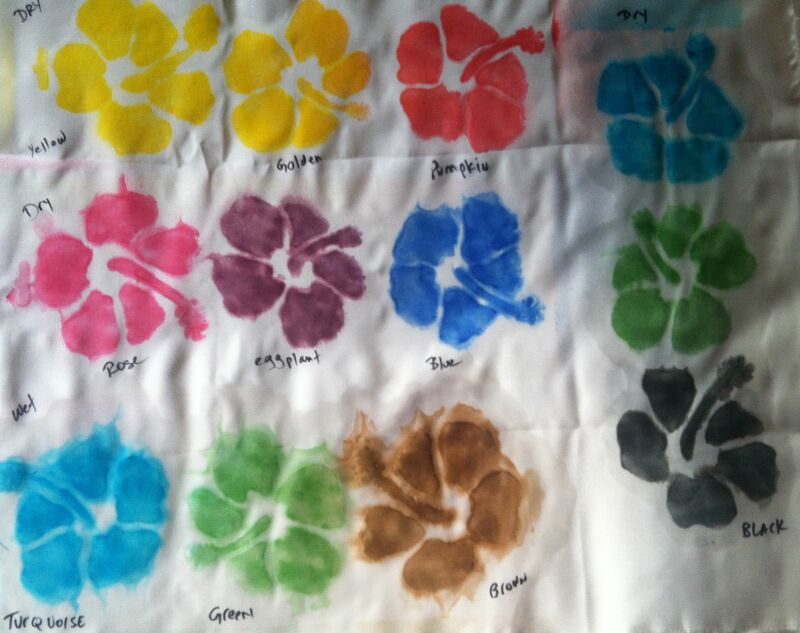 I also worked with an open stencil on dry and wet silk fabric and made myself a color chart of the 10 colors on hand, all prepped at the same strength. Marlene introduced me to using shaving cream as a medium to use a silkscreen to transfer a dye. The dragonflies below start with the green dye and a rose & green mixed together using the shaving cream as the transfer media. I also pulled some lichen and mixed in into the next cream batch and gave that a try. The lighter color rose brown is the lichen screen print. So now I’ll wash and iron the results and ponder the next step. 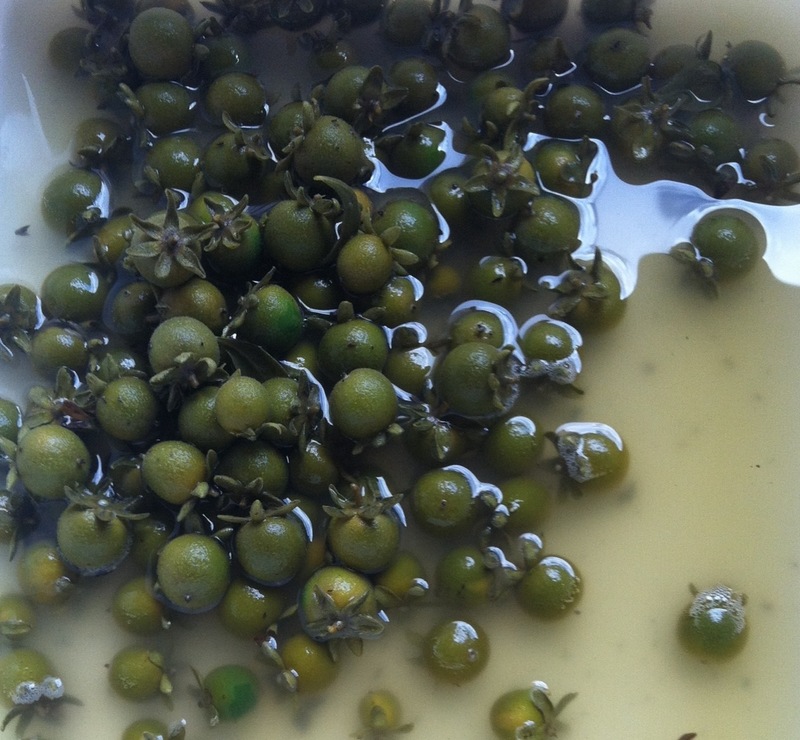 I have guar gum I can use for the transfer media with my lichen and persimmon so that would be another direction. Perfection in the printing is not my goal. An ikat image on a warp is definitely going to be fuzzy so I’m not concerned with the open stencil wet edges. For now I’ll stay with my chemical dyes and see what else I can do with them. Once again I am working with Diospyros texana Texas persimmon, Mexican persimmon, Black persimmon, Chapote, Chapote prieto member of the Ebenaceae (Ebony Family). About two weeks ago I did an early pick. The persimmons were green and hard, not a hint of softness. They’ve soaked for two weeks so they are very easy to smash. I dumped them into my plastic tub & pulverized them as best I could. 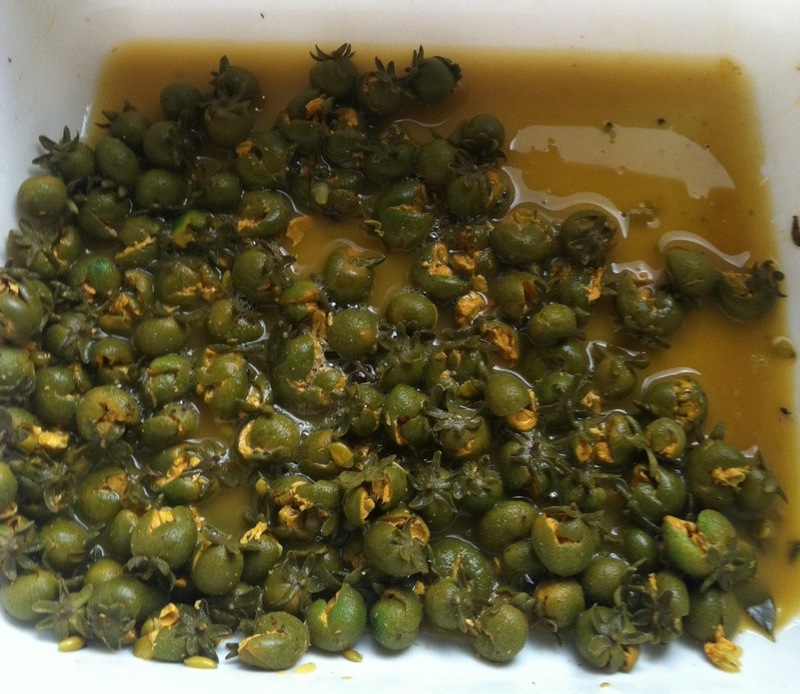 The meat and seeds were released and one can see the yellow dye. They’ve gone back in the jar for another week’s soak and then it will be time for some dyeing. Other branches have already been weighed down by the persimmons’ weight OR broken by raccoons starting their tastings early. 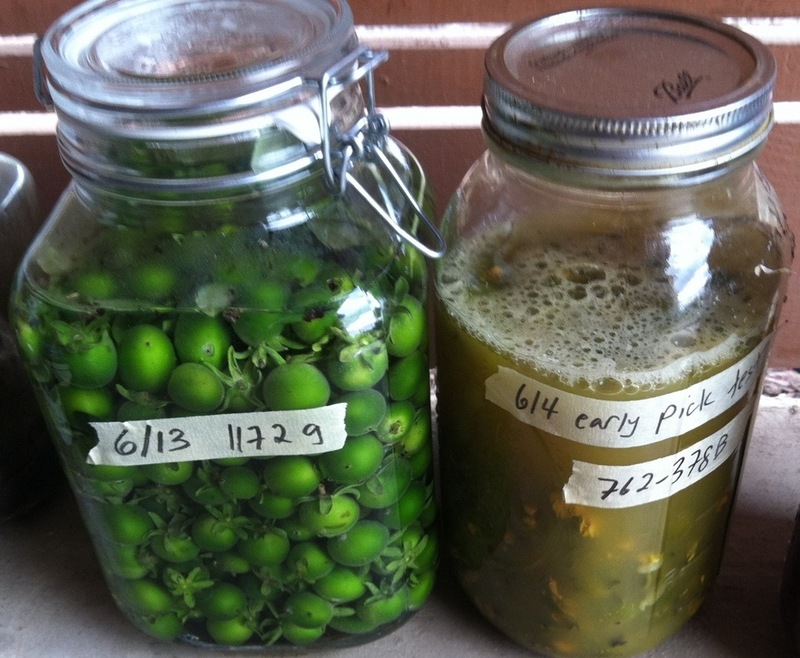 John and I trimmed those and I’ve started another jar soaking. To my eye and feel it still looks early for good color but one just has to test to understand the color window! I am sharing the news of my lecture at the Textile Museum on July 18th in Washington DC. Some of you have seen my lectures on the Lao, Cambodian and other looms in the Southeast Asia region via Complex Weavers or thru a weaving guild presentation. I give full credit to the folks on this side of the ocean that taught me to weave and gave me the opportunity to teach, the weavers on the other side of the ocean in Southeast Asia that proudly showed me how they wove and the anthropologists that patiently assisted along the journey’s way to understand the cultures around the loom. I am happy to have been given the opportunity to explain how these exquisite cloths are created by traditional and contemporary weavers on very simple looms from the weavers’ point of view. If you cannot make it, please mark your calendar on July 18th and send me calming thoughts! Please pass the word to any whom you may think would be interested in this lecture. 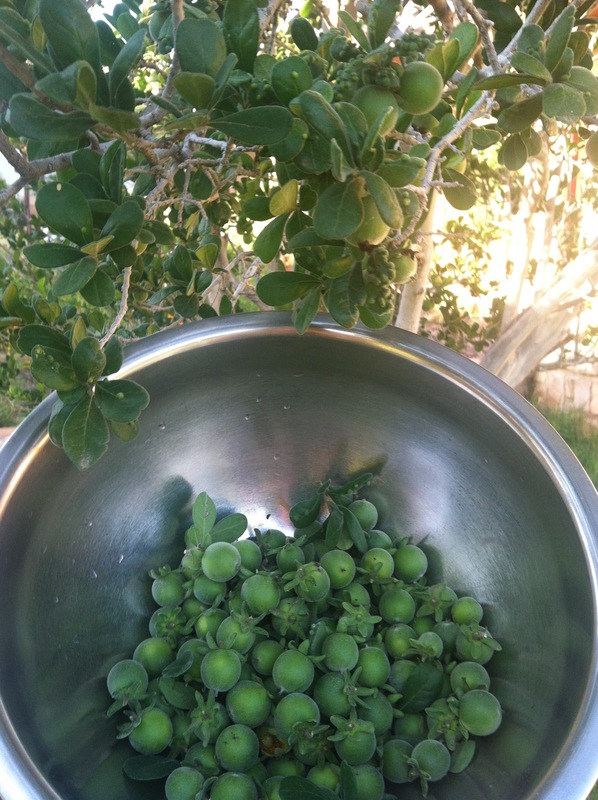 Time to harvest & soak the persimmons! This is something I can do with my left hand. My friend, Bettes, has encouraged me to paint warp skeins while I go thru my shoulder rehab. Wheels are turning!